That dress is still half cut, and I haven’t forgotten about it nor the other versions I want to create. In the meantime though, I have been adding some great new basics to my closet, including this latest. Pardon the sunburn. I have been dreaming in navy and mint for a while. 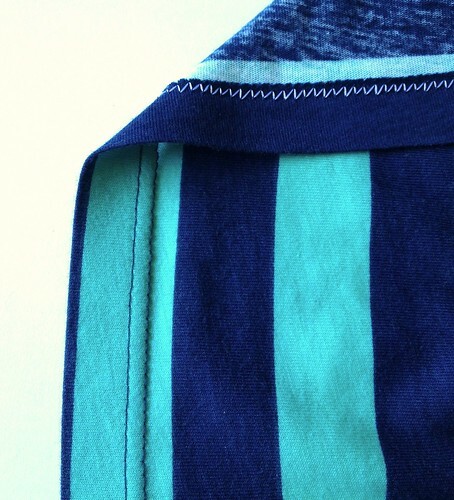 I’ve even sketched up a few garments with this color combo, but they haven’t made it to the cutting table. Then Girl Charlee started the presale for this fabric. I was initially thinking I would make a striped Tira with it, but I went this way instead. (The brighter mint in these pictures is more accurate than the one on their website, at least on my monitor.) GC calls this fabric a “cotton jersey blend,” but I’m not sure what it’s blended with. I doubt there’s lycra because it doesn’t feel that way in the stretch, and there’s next to no stretch on the straight grain, which lycra blends typically have. I did a burn test. I’m a bit of a pyro so I like doing those, but I don’t have much experience with deciphering them. It smelled like paper, did not self-extinguish, and left a brittle, crushable black ash. I’ve got a bunch of fabric burn charts but this didn’t perfectly fit any of the descriptions, maybe because it’s a blend. Anyone know? Anyway, I’ve already worn the top and did not find it too warm, which I typically do if there is much non-breathable (synthetic) content. The fabric was great for this pattern, in most regards. It’s stable, a good light-medium weight, decent cross-grain stretch, and very easy to control and match stripes. The only caveat I have is regarding the bindings at the back neck V and sleeves — if you use fabric like this one without straight-grain stretch, they may need to be a little longer, so use your judgement. This top came together so quickly! You choose the outlines for the pattern pieces based on your full bust, hip, and desired front length. You can also provide shaping at the waist, if you want. I made the 50 based on my full bust measurement of 51″. My desired length (28″) and actual hip measurement (54″) were a bit outside of the scope provided, but drawing the lines to fit me was still super easy; really, it was no more difficult than if those dimensions had been provided. The “connect-the-dots” method takes all the mystery out of fitting. It takes a couple of minutes to draw your lines based on your body, and tada — custom fit. 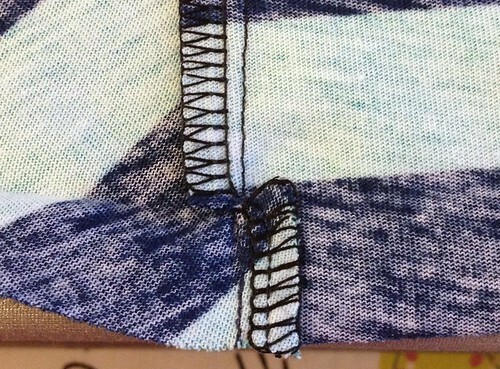 Then, just press the hem up again, adding your fusible webbing if desired (which it was for me). This little snip makes a huge difference — not only is the hem more even, but the reduced bulk makes stitching over that part much smoother. Regarding the wooly nylon, it does seem to have provided even more stretch to the hem, but it’s hard to tell without doing a side-by-side comparison with the same fabric. Which I haven’t. My next planned Cabarita is… wait for it… a solid. Whaaaa? I know! I went to the stash closet, thinking I would make a solid one with contrasting print details, and ended up choosing to make it entirely one color. I’ve never made such a decision before. I only possess solids in my stash for coordinating purposes! The only thing I can figure is that I love the details already baked into this design, and I just wanted to let them speak for themselves. Who am I and what have I done with Susan. In other news, I’m really behind with documenting and posting about MMM! Catch-up coming soon. Well, at least in May. I love your Cabarita and the hemming tip is awesome. I’ll do that definitely. Thanks! This was one of those things that seemed so *obvious* after she explained it to me, but I had never even thought about it before. I can’t believe how much smoother it is. You’re torturing me!!! LOVE THIS!! I can’t wait for my pattern to come. Looking forward to seeing how your solid comes out. Do you think if you added piping along the front collar it would still stretch or wear well enough? Your new top looks terrific! I really like the collar and the back detail was a surprise I didn’t expect! Great fit. Thanks Nessa! I love the back so much. Pity I never get to see it… ;) Steph says it can just be worn backwards, but I haven’t tried that yet! love the back – a surprise that i wasn’t expecting from the front. also super job matching up those stripes! I love it, especially the back. I can see that following your blog is probably not going to be good for me in that I might end up buying a lot of the patterns I see you make. I really like the back and my first thought was to wonder if I could find another linear like pattern and make a Rorschach Cabarita. Thanks Kimberly! :) I love that idea. I am keeping an eye out for less obvious, linear prints but haven’t seen a great one yet. Let me know if you find one! Waaaah! I’m so envious! I love this pattern and it looks wonderful on you. Lovely, lovely, lovely! I can’t wait to get mine! I have a mind to try making it with two fronts to get that nice roll collar all the way around. That is a lovely top Susan. Really looks great on you. You have done a wonderful job sewing it too. very nice! love the back neckline. wasn’t expecting that at all! It’s definitely an eye-catcher, especially with the contrasting stripe directions! It looks gorgeous! I have been admiring the Cabarita top, and now you have made me even more interested in it. It just looks so smart and comfortable! Wow! Very attractive top on you! I like the front and especially the back. 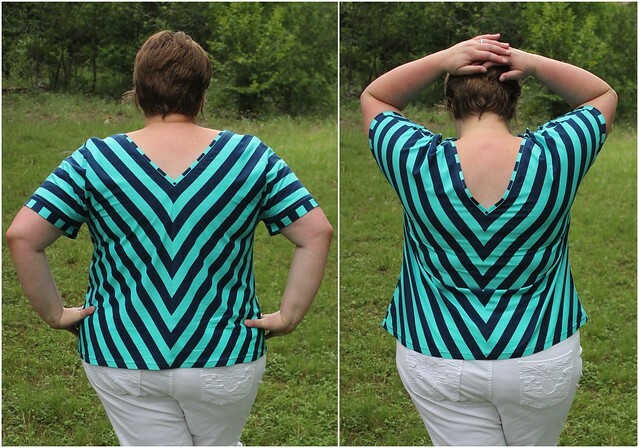 Superb work on stripe matching, creating the “chevron” at the back. Wow, again! Thanks Heather! 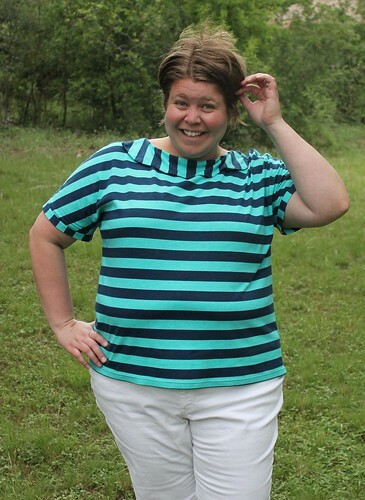 The stripe matching is made so easy since there is a line for this purpose printed right on the pattern. I love how it turned out! 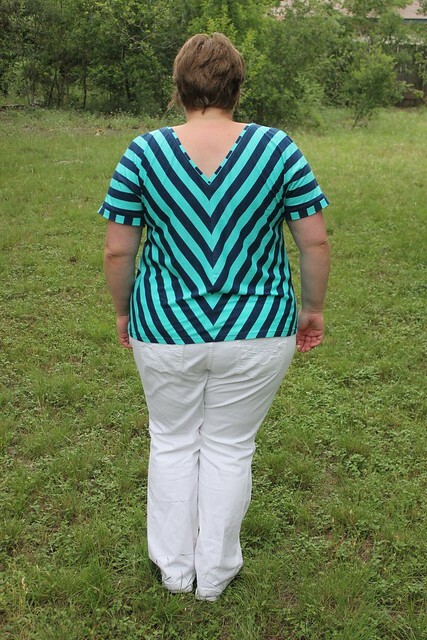 With the wide stripes the back is so dramatic – it looks great! I also like your collar and sleeve treatment – way to take advantage of those stripes. 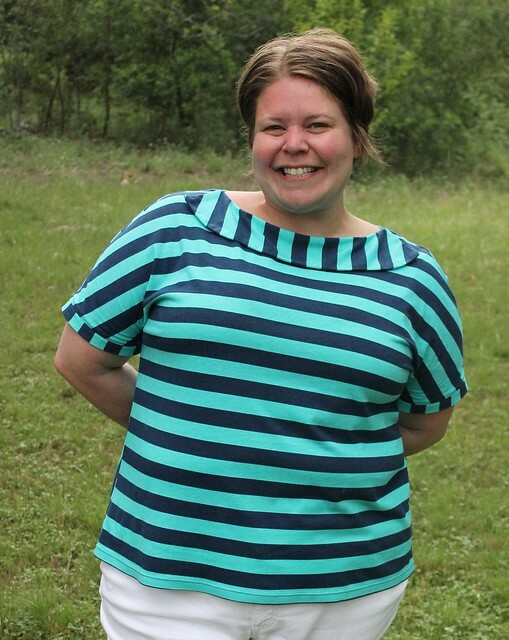 Thank you Chuleenan — Steph loves playing with stripes and designed the contrasting directions into this one. Such a stunning effect! This is a really great top on you. I like how you paired it with white pants ~ it looks great. Somehow the white jeans really made the colors pop even more… a great pairing! I love playing dress-up with newly made pieces, seeing what other garments, accessories, etc. that they get along with. Thanks, Jenny! Super cute! I’ve been kinda sorta thinking about getting this pattern. I love the back neckline detail, especially, but i have had the hardest time fitting my tiramisu so i’m a bit gun shy. plus, there is something i don’t totally love about fitting/wearing kimono sleeves. but it does look just so darn cute!! Thanks Megan! There are differences to learn for tweaking this kind of pattern sizing methodology. Personally, I’ve found that getting a good fit from each pattern company has been like learning a new language from scratch! The Cake language was really quick for me, but I know it hasn’t been that way for everyone. One thing I have found though — not all kimono sleeves are the same. 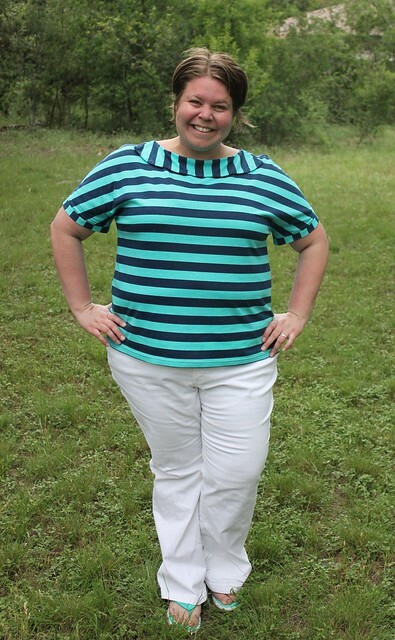 I’ve been meaning to return to that McCall’s pattern that we talked about (6566)… I’ve learned that I can’t stand the cut of that t-shirt, and I need to make it closer fitting under the arms to make it comfortable for me. With the Tira and Cabarita though, that fit has been just right. It’s not necessarily intuitive to learn how to alter the cut-on sleeve armscye when it’s different from what we’re used to, but it can be done. If you want to, feel free to reach out to me via email about your Tira fitting; I’d love to help, if I can! That top is DARLING on you! Great color choice! And I love the white pants – I’m a white pants girl myself! Your works is so flawless! Aww, thanks Nicki. :) Trust me it’s not flawless, but it’s close enough for me and I love it! Yes, I’ve really liked having this pair of white jeans, and I’m amazed that I’ve been able to keep them white for this long already. We’ll see how long I can, HA! Oh My Gosh! How cute is that top? Great colour. Chevron perfection. It even looks like the stripes on the collar match the top where they can! Gorgeous! I love it! You look fabulous! Great fabric, gorgeous colors on you and what a fit! Great work. I love the hemming tip thankyou! 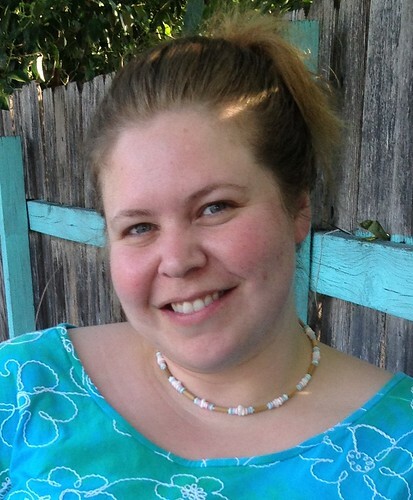 Your Cabarita looks fantastic, the fit is great and now I really cannot wait until mine gets here! I think you’ll love it, Suzy… and it will be in your hands before you know it. :) Thanks! Thanks for the hemming tip! Your top is such a fun color and it looks great on you. Love those stripes on the back! It’s like business in front and party all up in the back. And what a nice double-needled hem. I need to try that someday. Yes, mullet shirt, ha! Twin needle hemming did take me a while to master, but I love it now. Lovely top, Susan! This is one of my favorite stripes and you look so beautiful in it! I know this post is a little late. First time at your site. I am 57 and just learning how to sew with knits. Never to old to learn (so “they” say) . I love this top! Great Job! What is wooly nylon for the bobbin? I asked for it at JoAnn’s. The gal cutting material for customers said she did not know what it is. Do I find it in the thread department? It is clear? I do not sew much. Just now trying to alter my tops by shortening the too long ones. Been trying to use my new twin needle but still experiencing some skip stitches. Do you think using wooly nylon in the bobbin make the difference? Thanks for your help as I have lots of tops and tank tops that are way too long! I am having so much trouble with my tention when using double needles. The bobbin thread just lays there between the two threads on the underside. If I pull on the bobbin thread it slides right out with NOTHING holding it to the other top stitches. Help me !!!!!! I bought stretch double needles and stretch thread and nothing is working.